This recipe will make 16 rolls (or less if you decide to make yours a little bigger). I found these quite quick and simple to make. They prove quite quickly (apparently this is due to the spelt flour which proves faster than strong white flour). 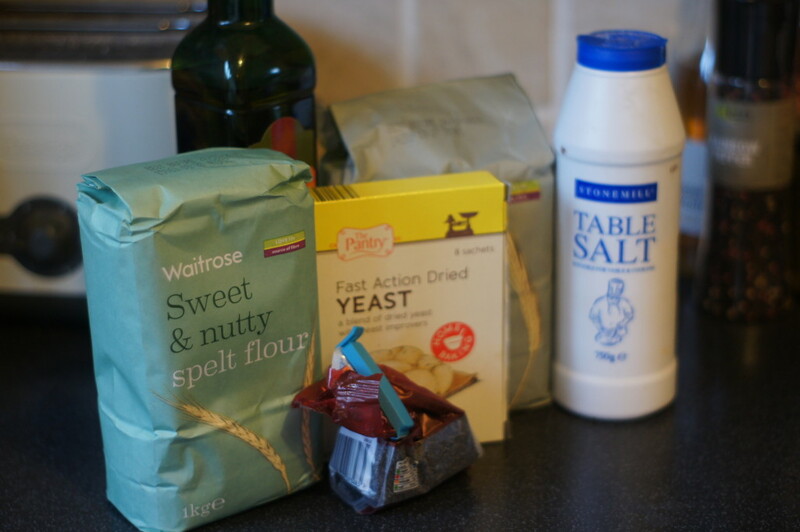 If you can’t find spelt flour (mine was from Waitrose), you can use strong white flour instead, but it will take longer to prove. You will need two baking trays to bake them on. They can be frozen for up to a month. 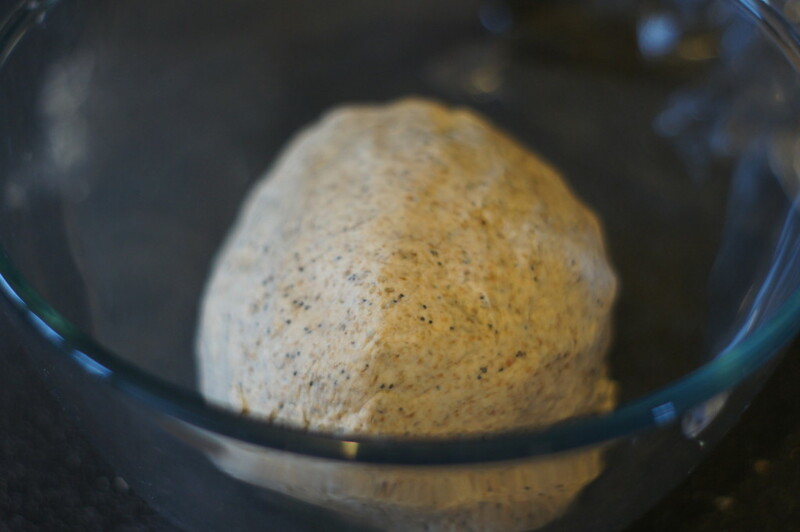 1) Mix together the two flours, poppy seeds, salt and yeast in a large bowl. 2) Take 450mls of lukewarm tap water and mix in the oil. Add this gradually to the flour, mixing with a metal spoon as you go until the mixture just starts to come together. (Depending on the type of flour you use e.g. its brand or age, this will affect how much water you need to use. You may need more, you may been less. I needed less.) You know you’re done when there are no areas of dry flour left. Cover the dough in the bowl with clingfilm and leave for 5 minutes. (This helps to reduce the amount of kneading later). 4) Sprinkle your baking trays with spelt flour. Knock the dough back once it’s doubled by tipping it onto a work surface and pressing the air out of it with your hands. Cut the dough into 16 even sized pieces (either weigh the dough and divide by 16 or cut the dough in half, then half again, then each piece into quarters). 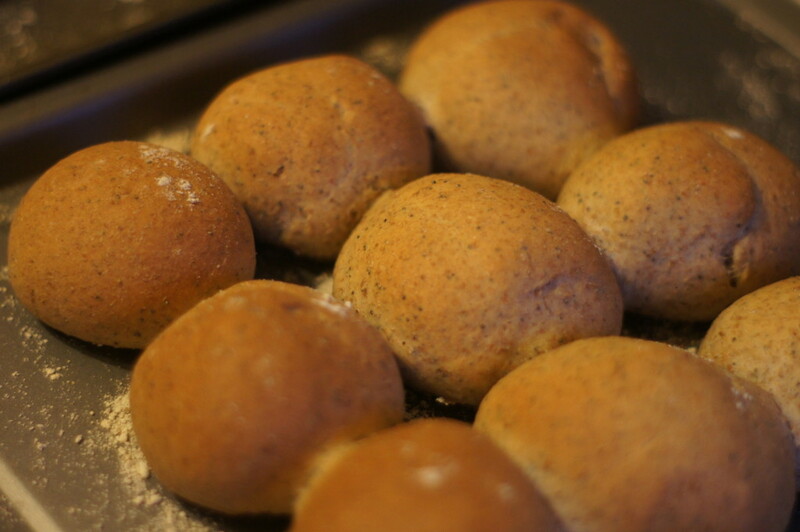 Roll the dough into balls using well floured hands and place onto the baking tray about 1cm apart. Repeat until all the dough is used up, sprinkle with flour and cover with clingfilm. Leave to prove until they are doubled in size (the rolls will be touching once proved). 5) Preheat your oven to 220°C/Gas Mark 7 and then bake for about 15 minutes until well risen and golden brown. Remove from the tray and cool on a wire rack.